110cm long, 45cm wide, 47cm high. 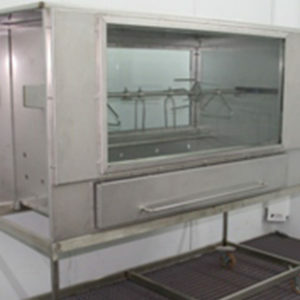 Stainless steel lid, one glass viewing panel. Stands on 4 rubber feet. 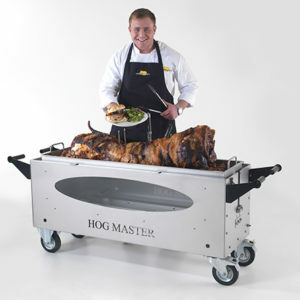 This fantastic hogroast machine is ideal for smaller parties and events up to 50 people. It will cook up to a 40 kilo pig and has all the attributes of the larger machines. Simple and easy to use with its stainless steel construction it is easy to clean and maintain. 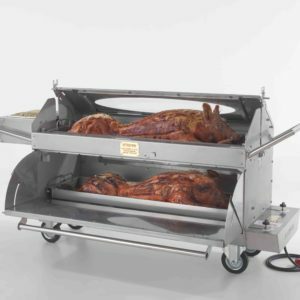 This versatile machine can be used as a hog roast machine where the pig cooks in a tray ideal for slow cooking and producing pulled pork. 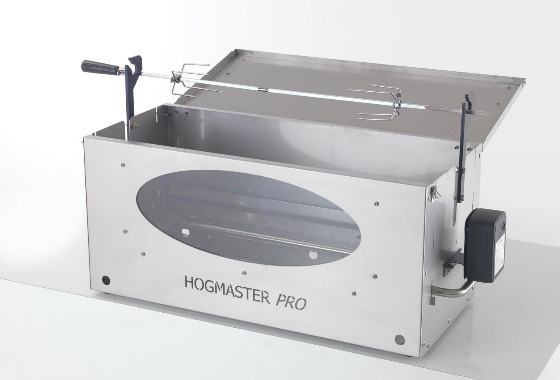 A spit roast where the pig turns whilst it is cooking this can be operated by a battery powered motor meaning it can be used anywhere or a plug in motor for extra power. It also makes a great bbq, the bbq plate can be used to cook other items whilst the pig is cooking it even cooks a mean pizza. 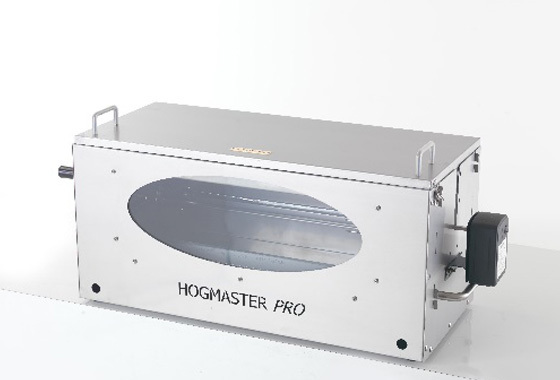 This is a very tough hog roaster for cooking smaller pigs, lambs, turkeys etc. 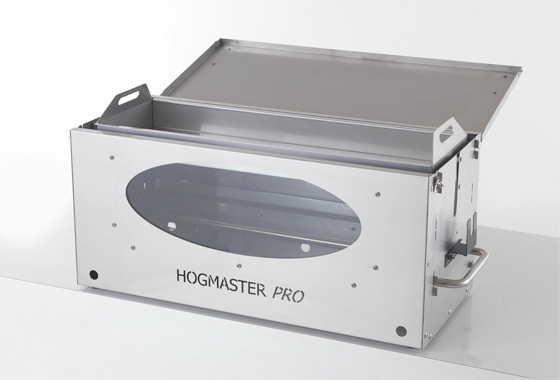 It incorporates a lot of the features and durability of the larger Hogmaster machine but in a smaller package. It is ideal for smaller parties, pubs and restaurants who are short on space and home use. 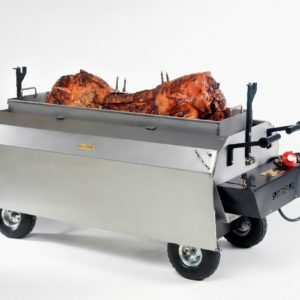 It is also a great additional machine for caterers giving them the option of offering a choice of meat or for hiring out for smaller parties. Will cook up to a 40 kilo pig head off, or 35 kilo head on. Cooking time 1 hour for every 10 kilos of pig. 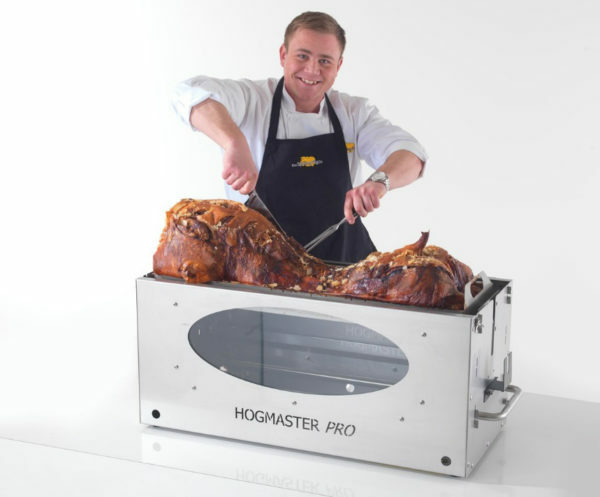 Will cook up to a 45 kilo pig head off, or 35 kilo pig head on and 30 jacket potatoes at the same time. Cooking time 1.5 hours for every 10 kilos of pig.